I agree with you Mica - save money on clothing an invest in accessories like great bags and shoes! I don't get to thrift as often as I'd like but there are so many good deals to be found and it's fun to find treasures! I agree on being wise with a clothing budget. Although, I can afford splurges, I like to have a mix of high and low priced items. I enjoy thrifting and a good consignment shop. I really like the warm color of your RM camera bag. You find some awesome thrift finds. I so need to start thrifting more. I love your budgeting logic of save on clothes, splurge on accessories! That's great that you've been able to have such good luck in thrift shops in your area. 67 cents for a shirt?!? That's amazing! I was so sad when that opshop closed! The fill a bag for $2 sales were the best! I couldn't agree more, Mica!! And you always show how so many things can be worn different ways. Plus you get the best deals ever!! Oh that skirt is so fabulous! I love the boho vibe of it! 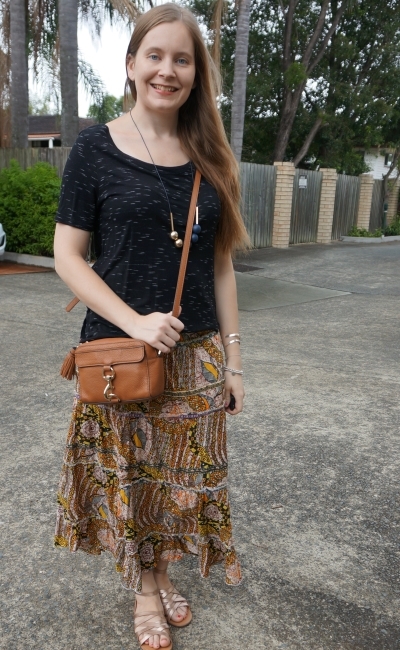 I love that last maxi skirt, and I love reading how you maximize your purchases. I'm guilty of not wearing most of my clothes that frequently, but I love variety and wearing new things. Congrats on your lovely bag finds. That fuchsia bag really pops on your outfit, Mica! Love that beige bag too because it´s a classsic color all day long. I love to re-wear pieces that are already in my closet. If I bought it, it usually means I love it so I'm always excited to find new ways to style something. I'm always surprised by the amazing deals you find. I think my absolute cheapest item was $5 and deals like that are very difficult to find and usually only apply to t-shirts. I can't believe that you got both the top and the maxi skirt for one dollar each. Those are great thrift purchases for sure. I do agree that the first look is perfect for a busy day. Very feminine and pretty but it also looks comfy. The bag is simply the perfect pop of colour. I really like the second outfit as well. I have a skirt very similar to yours, I bought it many years ago when I worked in Italy. Great outfits, both of them. We don't have many thrift stores here in Mostar, but I do visit second shop stores in Split occasionally. 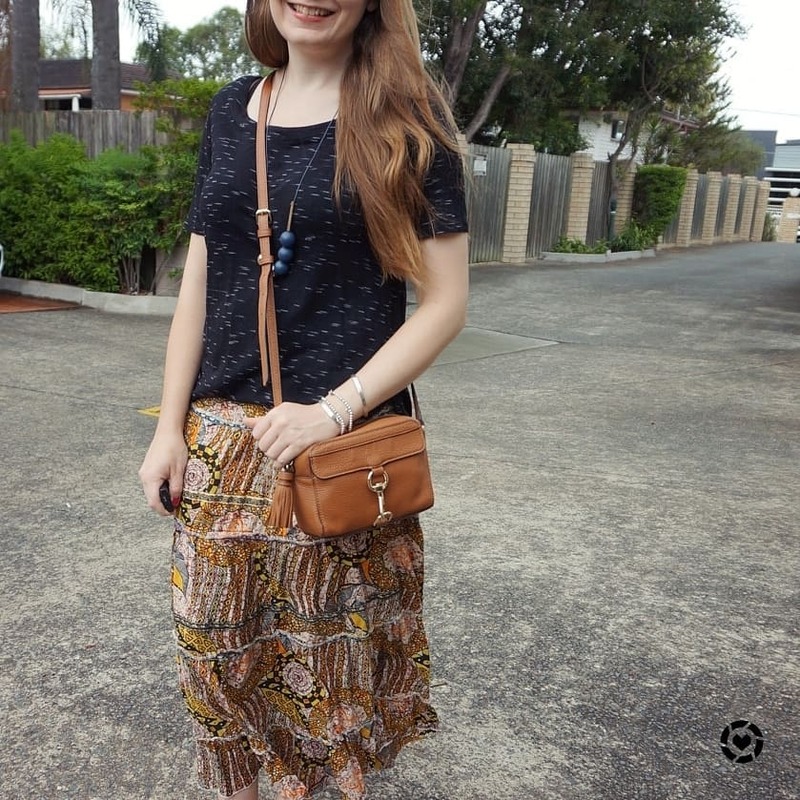 The tribal print skirt is so pretty!! I wish we had thrift shops here but we don't, I would love to experience this and find little treasures!! Those are some really great finds, and on a budget too! 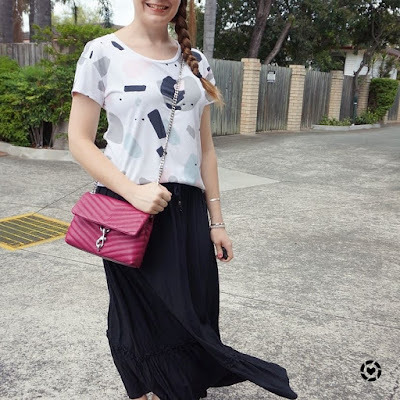 You look absolutely gorgeous and I'm loving the 1st black maxi skirt too! Thank you for sharing! 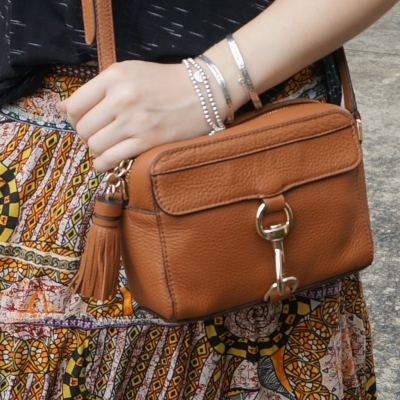 Love both Rebecca Minkoff bags! They have a classic look to it! OMG the Eddie in Magenta is amazing!! I love that so much, now that's on my wish list, ha ha! Definitely a good one to have on your wishlist! I love your approach, lady! I find myself doing this, too- I save on trendier pieces and throw my hard-earned money toward more investment pieces that'll last for ages! I just have to laugh when you talk about your $1 shirts and skirts and then kind of gloss over the bag :P You have an amazing bag collection! I do love that pink one but I think the camera bag might work better with more things for me. It's amazing that you've found such great deals. I need to go thrifting more often, though I did get my favorite dress at a thrift store for $8 and I wear it once or twice a year. The skirts, especially, are lovely! I hope the heat is letting up (for your sake....I love the hot) and that you have a wonderful rest-of-the-week! Haha yes, the bags are always the splurges in my outfits! I love looking around at pre-loved clothes. What's the saying? "Another man's trash is someones treasure" Something like that anyway! You really did grab a bargain with these outfits! I can't believe how cheap they sell the clothes. One item would cost around $3.96 here in the UK in some of the charity shops we have, so definitely picked up a bargain! Yes I got really lucky with these finds! Thift stores arent usually that good here! I love that top in the first outfit. I need to start thrifting more! 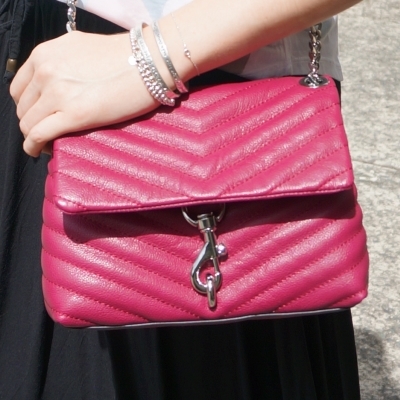 Love both look and dying over that pink quilted bag. Such a statement piece. I was so thrilled to stumble across it in the opshop! You found some great items!! I especially love that gray print tee--it's just so different and fun. I don't blame you for putting your money towards bags--you have some great ones and they will last for a long time! I do think they are great fashion investments! I can't believe how cheap the items at your opshops are! All the ones I've gone to in the states prices start at around $3 or so. You find good deals all the time, especially the 'fill a bag' deals. I think that would be so much fun to do and get some items for my daughters, too. I like to spend money on certain things like bags or shoes, too! We all have the items we like to splurge on! So cheap! you have a great eye for thrifting! I love the skirt from second outfit so much! and first top is definitely something I would wear way too often. As usual your fantastic taste in bags takes the whole outfit to the different level. When it comes to great buys secondhand shopping I think having a store you can visit frequently is the key - you will always see the best new things when they arrive! That's such a cute tee! That's amazing that it was $1! And I definitely love to splurge on bags!